Are you looking for the perfect “date night” movie? The Longest Ride is the movie you want. I have been to my fair share of “chick flicks” and they always end with everyone crying. This is not anything like that. The Longest Ride is a love story within a love story. It is set in North Carolina where Sophia (Britt Robertson) attends Wake Forest University. Sophia is an art lover and is preparing for her internship at an art gallery in New York City when she is dragged to a rodeo by her sorority sisters. While watching the rodeo she focuses in on a young bull rider, Luke (Scott Eastwood), who is thrown off his bull and loses his hat. When she picks it up he tells her to keep it and the love story begins. While out on their first date they stumble upon this elderly man Ira (Alan Alda) who has been in an accident. After dropping him at the hospital Sophia stays to make sure he is okay. He has a basket of letters that he wrote to his late wife all through his life and asks Sophia to read them to him. This is where the love story within the love story begins. 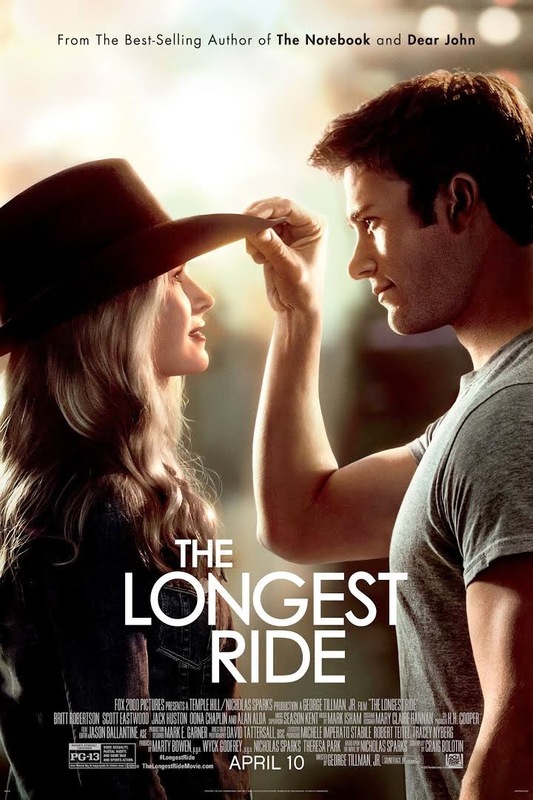 The Longest Ride is about love, dedication, courage, devotion, compassion and pride. Throughout the movie the characters show and remember romance and love in a deeply personal way. I highly recommend this movie as the perfect date night movie.